The Vinten HD-VRC Control System is a client server hardware/software solution that provides multiuser, multi-facility control of Vinten Robotics pedestals, heads, and elevation units. The system includes a 2 RU rackmount control station with an HD/SD-SDI thumbnail capture card that runs Windows 7 and the Vinten VRC software. A keyboard and mouse are also included. A monitor is sold separately. Using flexible Ethernet network architecture, the touchscreen user interface of the included VRC software allows the controller to be configured for multiple devices and multiple studios within the same network. 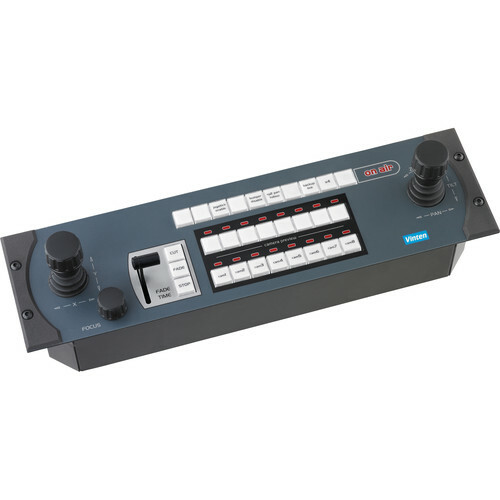 Additionally, multiple controllers can be added to the network to enable control of any camera from any control room with the right permissions. Systems are connected via TCP/IP, RS-232, and RS-422 protocols.